Cinematic Titanic was a project by Mystery Science Theater 3000 (MST3K) creator and original host, Joel Hodgson. The project involved "riffing" B-movies, in a manner similar to that of MST3K. Joining Hodgson were some of the original MST3K cast, as well as some cast members who joined later in the show's run. These included Trace Beaulieu, J. Elvis Weinstein, Frank Conniff and Mary Jo Pehl. It was first performed live on December 7, 2007 and first aired on December 22, 2007. 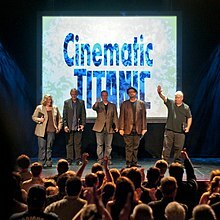 On February 16, 2013, it was announced that the touring portion of Cinematic Titanic was going on an indefinite hiatus. According to an email sent out to members of the site, due to "5 people living in 5 different cities with different lives and projects, it has become increasingly difficult to coordinate our schedules and give Cinematic Titanic the attention it requires to keep growing as a creative enterprise and a business." The final tour began on September 23, 2013. Like Mystery Science Theater 3000, the series used black silhouettes of the riffers placed over the films, but in the case of Cinematic Titanic they sit on both sides of the screen rather than just on the lower right. Visual gags are frequent (such as Beaulieu's use of a cherry picker in The Oozing Skull), and there are two or three host segments per episode, all performed in silhouette. The actors essentially play themselves as they participate in an experiment for some unknown (possibly shadowy) corporation or military force. The story currently provided to the cast is that there is a tear in the "electron scaffolding" that threatens all digital media in the world. Their experience doing MST3K is key to the organization's plans. The riffing for each film is recorded to a "nanotated disc" and inserted into a "Time Tube" by Hodgson that descends into the frame at the end of every episode. The unknown organization is very firm on keeping the cast focused on their duties, providing no time frame for completion and requiring them to stay within the facilities at all times. They apparently have massive resources and an autonomous military force, which they use to keep the cast in line. The cast is inquisitive of the true purpose of the experiments but have no major problems as, aside from having to watch bad movies, they are well-treated. When asked about potential collaborations with those involved in RiffTrax, Hodgson told New York magazine, "I don't know. I think those guys—Bill, Kevin and Mike—are really talented, obviously. I think anything’s possible, but I thought it might get confusing to try to merge them together or do crossover projects. I would never rule it out because it's all kind of the same universe. But RiffTrax, the idea of riffing on topical movies, is a different thing. And I like that the movie-riffing universe got bigger when they decided to do that, but we just do weird movies you've never seen before." In a question and answer session at the Tivoli Theatre in St. Louis, Missouri, it was announced that Cinematic Titanic would begin to release recordings from their live shows as "Live" DVDs in an effort to bring the energy of their on stage antics into people's living rooms and further promote the stage show. When asked if this meant the demise of the studio produced DVDs, J. Elvis Weinstein said, "No, studio releases will return at some point in the future." The first of these "Live" DVDs to be released was East Meets Watts, which was recorded in front of a live audience during one of the group's performances in Los Angeles. The first live performance was a private show for employees of Industrial Light & Magic on December 7, 2007. After the live show, the cast reworked some jokes, delaying the original December 10 release date. The first episode of Cinematic Titanic was released on DVD to the public at midnight on December 21, via the download-to-burn company EZTakes. According to the Cinematic Titanic website, due to rights issues, the episode was not available for download until April 2, 2008. Both the private show and the first release feature the B-movie Brain of Blood. One of the original film's producers, concerned that creating multiple versions of the film could create marketplace confusion, requested that Cinematic Titanic's version have a different name. To alleviate his concerns, Cinematic Titanic retitled their release The Oozing Skull. In June 2012, the first ten DVDs were made available for free viewing on Hulu. In March 2013, Cinematic Titanic sold the last of their on-hand DVD stock and ceased pressing their own discs. From then on all releases were either in digital format, or through Amazon.com's print-on-demand service. In May 2017, Shout! Factory announced a Complete Series set, featuring all twelve episodes previously released, would arrive in August. Releases have been available to purchase as a physical DVD, and also as a download and burned DVD version. The Oozing Skull December 21, 2007 1972 Original release called Brain of Blood on IMDb , changed per producer's request. Legacy of Blood October 9, 2008 March 17, 1971 Original release called Blood Legacy on IMDb . Santa Claus Conquers the Martians November 20, 2008 November 14, 1964 The film had previously appeared on an episode of MST3K and was later done by Rifftrax. Blood of the Vampires March 19, 2009 1966 Original release called Whisper to the Wind on IMDb . East Meets Watts December 16, 2009 May 1974 First DVD featuring a live performance rather than a studio version. The film was titled The Dynamite Brothers at the live shows. The Alien Factor February 23, 2010 1976 Second DVD to feature a live performance. Danger on Tiki Island June 15, 2010 1968 Third live DVD; originally titled Brides of Blood on IMDb . War of the Insects December 2, 2011 November 9, 1968 Also known as Genocide on IMDb . The following is an incomplete list of live performances by Cinematic Titanic. December 7, 2007 The Oozing Skull San Francisco CA Private show for Industrial Light & Magic employees. April 26, 2008 The Wasp Woman Dallas TX Public show (sold out) as part of the 2008 USA Film Festival in Dallas, Texas, at the Angelika Film Center, Dallas. Movie shown: The Wasp Woman. The crew, sitting in the front row of the theater, with microphones and scripts, announced that the performance was being recorded for an upcoming DVD release. They signed autographs for the enthusiastic crowd after the show. June 21, 2008 The Doomsday Machine Hollywood CA Public show (sold out) as part of the 2008 LA Film Festival in Hollywood, California, at the John Anson Ford Amphitheatre. Movie shown was scheduled to beThe Wasp Woman, but changed without prior announcement to The Doomsday Machine. No screen interaction, the team sat onstage with their scripts. October 25, 2008 Blood of the Vampires Minneapolis MN Public show at the State Theatre in Minneapolis, Minnesota. The movie Blood of the Vampires was shown for the first time. Dave (Gruber) Allen was the warm-up act. November 1, 2008 Santa Claus Conquers the Martians St. Charles MO Public show at the Family Arena in St. Charles, MO. Santa Claus Conquers the Martians was the film shown, and Dave (Gruber) Allen performed as the warm-up act. December 18, 2008 Santa Claus Conquers the Martians Chicago IL Public three-night series in Chicago, IL at the Lakeshore Theater. The December 18 show at 7:30pm featured Santa Claus Conquers the Martians, the December 19 shows at 7:30pm and 10:30pm featured Blood of the Vampires, and the December 20 shows at 7:30pm and 10:30pm featured Frankenstein’s Castle of Freaks. The latter two movies were promoted as 'Unreleased Titles' until a few days before their Chicago appearance. All five shows were reportedly sold out, according to J. Elvis Weinstein through the Cinematic Titanic email Newsletter. Dave (Gruber) Allen performed as the warm-up act. As this appearance marked the first anniversary of Cinematic Titanic, a "Best of" reel was shown after each performance. February 13, 2009 Blood of the Vampires San Francisco CA One public show at the Marine's Memorial Auditorium in San Francisco, CA. February 14, 2009 East Meets Watts San Francisco CA East Meets Watts was billed as Dynamite Brothers. Dave (Gruber) Allen performed as the warm-up act, the "Best of" reel was shown. February 19, 2009 War of the Insects Royal Oak MI Two public shows at the Royal Oak Music Theatre in Royal Oak, MI. The first show was War of The Insects, followed by Samson and The Seven Miracles of The World on IMDb . 30 minutes into the first film, the screen went black. Music Theatre staff scrambled for 5 minutes or so to re-establish visuals, giving the group time to ad-lib (most commonly at Detroit's expense). Dave (Gruber) Allen performed as the warm-up act. February 20, 2009 Blood of the Vampires Somerville MA Two public shows at the Somerville Theatre in Somerville, MA. The February 20 show featured Blood of the Vampires. The February 21 show featured Dynamite Brothers. Both shows were sold out, according to an on-stage announcement. Dave (Gruber) Allen] performed as the warm-up act, the "Best of" reel was shown. May 22, 2009 East Meets Watts Mesa AZ Two public shows at the Mesa Arts Center, Dynamite Brothers billed as East Meets Watts, and Brides of Blood billed as Danger on Tiki Island, with Dave (Gruber) Allen and the "Best of" reel. June 12, 2009 The Alien Factor Philadelphia PA Two public shows at the Trocadero Theater in Philadelphia, PA, with The Alien Factor and Brides of Blood billed as Danger on Tiki Island, with Dave (Gruber) Allen and the "Best of" reel. September 10, 2009 East Meets Watts Chicago IL Three public shows at the Lakeshore Theater in Chicago, IL, with East Meets Watts (movie title of Dynamite Brothers), The Alien Factor, and Brides of Blood billed as Danger on Tiki Island, with Dave (Gruber) Allen and the "Best of" reel. December 31, 2009 War of the Insects/Samson and the Seven Miracles of the World/Legacy of Blood Glenside PA A 3 movie marathon performed in Glenside, PA at the Keswick Theatre. Performed on New Year's Eve, the first two movies were performed before midnight, and the third after midnight. Dave (Gruver) Allen opened. January 30, 2010 Danger on Tiki Island San Francisco CA One public show at the Castro Theatre in San Francisco, CA. Warm-up material provided by Dave (Gruber) Allen, Frank Coniff, and Josh Weinstein. February 20, 2010 War of the Insects Milwaukee WI Two public shows in Milwaukee, WI at Turner Hall. The 7:00pm show featured Genocide  billed as War of the Insects, and was sold out, according to the Turner Hall website, and an announcement at the start of the show. This show is notable not only as a return for Joel to his home state of Wisconsin (he was born in Stevens Point, and grew up in Fort Atkinson and Green Bay,) but also because it was his 50th birthday. The enthusiastic crowd sang "Happy Birthday to You" for him. The 10:30pm show featured Samson and the 7 Miracles . Dave (Gruber) Allen performed as the warm-up act, with a special appearance at the 10:30pm show by actor/comedian Patton Oswalt, who had just finished performing in town, and was recommended to come see the performance. Oswalt gave a short opener prior to the start of the film. Cast members were on hand to sign autographs after both shows. April 15, 2010 Danger on Tiki Island Northampton MA One public show at the Calvin Theater in Northampton, MA with Brides of Blood billed as Danger on Tiki Island, Dave (Gruber) Allen performed as the warm-up act. April 16, 2010 War of the Insects Princeton NJ One sold-out public shows at the McCarter Theatre in Princeton, NJ, with Genocide  billed as War of the Insects. April 17, 2010 Danger on Tiki Island Manhattan, New York City NY One sold out public show at the Nokia Theater in Manhattan, NY, with Brides of Blood billed as Danger on Tiki Island, with Dave (Gruber). August 3, 2010 War of the Insects San Francisco CA One public show at the Castro Theatre in San Francisco, CA. Warmup material by Mary Jo Pehl & Dave Gruber, Frank Conniff, and Trace Beaulieu & J. Elvis Weinstein. October 29, 2010 Rattlers Boston MA One public show at the Wilbur Theatre in Boston, MA, where they premiered their treatment of the movie Rattlers. November 13, 2010 Rattlers St. Charles MO One public show at the Family Arena in St. Charles, MO. January 29, 2011 The Alien Factor Concord NH Two public shows at the Chubb Theatre in Concord, NH, where patrons could buy tickets for either an early (7:00PM) show or a late (9:30PM) show. There was a discounted "double feature" price for those wanting to see both shows. The early show was the movie The Alien Factor and the late show was the movie Genocide  billed as War of the Insects. J. Elvis Weinstein, Frank Conniff, Trace Beaulieu and Mary Jo Pehl, in that order, all performed warmup material. March 30, 2011 Blood of the Vampires Newark NJ One public show at the Victoria Theatre. March 31, 2011 The Doomsday Machine Newark NJ Two public shows at the Victoria Theatre. April 19, 2011 The Alien Factor Princeton NJ One public show at the McCarter Theatre in Princeton, NJ with The Alien Factor and warmup material from the cast, including a live performance of the Mystery Science Theater theme song. May 6, 2011 Samson and the Seven Miracles of the World San Francisco CA Two public shows at the Castro Theatre in San Francisco, CA. The early show was Samson and the 7 Miracles of the World; the late show was Rattlers. Warmup material by Mary Jo Pehl & Dave Gruber, Frank Conniff, and Trace Beaulieu & J. Elvis Weinstein, finishing up with a performance of the MST theme song by Hodgson and Weinstein. November 3, 2011 Rattlers Reno NV Nightingale Concert Hall, University of Nevada, Reno. Warmup material by Mary Jo Pehl, Frank Conniff, Trace Beaulieu, J. Elvis Weinstein and Joel Hodgson, finishing up with a performance of the MST theme song by Weinstein. A Meet and Greet followed the performance. January 20, 2012 Rattlers York PA One public show at the Strand-Capitol Performing Arts Theater in York, PA. Warmup material by Mary Jo Pehl, Dave Gruber, Frank Conniff, Trace Beaulieu, J. Elvis Weinstein and Joel Hodgson, finishing up with a performance of the MST theme song by Weinstein. A Meet & Greet followed the performance. July 5, 2012 The Doll Squad Ann Arbor MI 100th Cinematic Titanic Performance and World Premiere of The Doll Squad. August 19, 2012 The Doll Squad Beverly Hills CA Part of the Everything Is Festival at the Saban Theatre. November 17, 2012 The Doll Squad St. Charles MO Public show at the Family Arena in St. Charles, MO. The Doll Squad was the film shown, and Dave (Gruber) Allen performed as the warm-up act. October 19, 2013 The Doll Squad San Francisco CA Two public shows at the Castro Theatre in San Francisco, CA. The early show was The Doll Squad; the late show was The Astral Factor. Joel Hodgson, Mary Jo Pehl, Dave (Gruber) Allen, Frank Conniff, and Trace Beaulieu. J. Elvis Weinstein was not present as he was suffering from cancer and had a kidney removed not long after. Dave (Gruber) Allen took over Weinstein's riffs during both performances. October 19, 2013 The Astral Factor San Francisco CA Warm-up material by Joel Hodgson, Mary Jo Pehl, Dave (Gruber) Allen, Frank Conniff, and Trace Beaulieu. Warm-up also included a showing of the short film The Frank, starring many Dave (Gruber) Allen and former Mystery Science Theater 3000 cast members including Trace Beaulieu, Frank Conniff, Mary Jo Pehl, Bill Corbett, and Beth "Beez" McKeever. J. Elvis Weinstein was not present as he was suffering from cancer and had a kidney removed not long after. Dave (Gruber) Allen took over Weinstein's riffs during both performances. ^ Meyer, John P. (January 12, 2008). "Good news for bad movie (and good humor) lovers: The MST3K crew are at it again". Pegasus News. Archived from the original on May 22, 2008. Retrieved 2008-06-15. ^ Ellis, Mary Beth (November 18, 2007). "Ex 'MST3K' stars, writers fill hole left by show". MSNBC. Retrieved 2008-06-15. ^ Hoevel, Ann (September 6, 2010). "Cinematic Titanic's struggle with 'Weisenheimer's'". CNN. Retrieved September 6, 2010. ^ a b c Hodgson, Joel. "Greetings Friends". Cinematic Titanic. Archived from the original on 2007-11-19. Retrieved 2007-12-02. ^ Beaulieu, Trace (February 16, 2013). "Cinematc Titanic will soon be riffing off". Twitter. Retrieved 2013-02-16. ^ "Cinematic Titanic - The Masters of Movie Riffing - Live Tour". Cinematic Titanic. September 20, 2013. Retrieved 2013-09-20. ^ a b Lewinski, John Scott (December 7, 2007). "Cinematic Titanic Steams Into Mystery Science Theater Waters". Wired. Retrieved 2007-12-15. ^ Ryan, Maureene (December 11, 2008). "Joel from 'Mystery Science Theater 3000' is back with a new cinematic experience". Chicago Tribune. Retrieved 2008-12-11. ^ Joseph Brannigan Lynch (April 16, 2010). "Mystery Science Theater 3000's Joel Hodgson on His Second Go-Round As a Movie-Mocker". New York Magazine. Retrieved April 29, 2010. ^ Hodgson, Joel. "It's on!". Cinematic Titanic. Retrieved 2007-12-21. ^ "Cinematic Titanic Episode Two Promo - Doomsday Machine" (video). YouTube. Cinematic Titanic. 22 May 2008. Retrieved 2008-06-15. ^ Weinstein, J. Elvis. "There's A Lot of Buzz Around Here". Cinematic Titanic. Retrieved 2008-08-07. ^ "Live Cinematic Titanic DVD Coming; New Tour Dates Announced". Satellite News. 2009-12-09. ^ "Next from Cinematic Titanic…". Satellite News. 2010-02-16. ^ "Show Guide - Danger on Tiki Island". Cinematic Titanic. Retrieved 2010-05-19. ^ "Live Tour". Cinematic Titanic. Retrieved 2011-08-16. This page was last edited on 8 March 2019, at 23:46 (UTC).